Woodrow Wilson's effort to create and promote a League of Nations at the close of World War I is often seen as a template for the interventionist foreign policies of his mid- and late-twentieth century successors in office, as well as the so-called liberal internationalist world order that emerged after World War II. Trygve Throntveit argues that this view is mistaken. The League as Wilson designed and envisioned it embodied a more egalitarian, cooperative, and adaptable--and thus more practical--version of "Wilsonianism" than did the comparatively hierarchical and adversarial UN architecture established under Franklin Roosevelt and Harry Truman. Recovering its origins in philosophical pragmatism and progressive social thought, Throntveit argues that Wilson's Wilsonianism represents an aborted experiment in global governance, one that can prompt disturbing yet fruitful questions about a diplomatic tradition and international regime that many today are trying to reinforce. Trygve Throntveit is Dean’s Fellow for Civic Studies at the University of Minnesota College of Education and Human Development. He is the author of William James and the Quest for an Ethical Republic. John Milton Cooper (Commentator) is Professor Emeritus at the University of Wisconsin and former Wilson Center Public Policy Scholar. 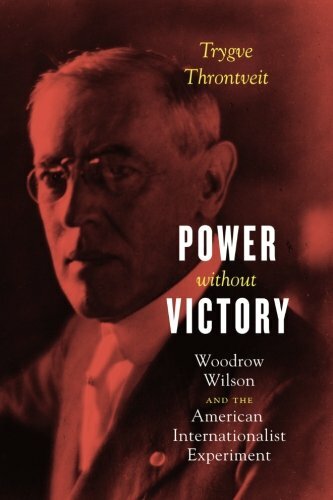 He is the author of Woodrow Wilson: A Biography (2009). Christian Ostermann (Moderator) Director, History and Public Policy Program, Wilson Center.